In the fall and winter, I absolutely love the butternut squash and autumn squash soup you can get at a various restaurants. 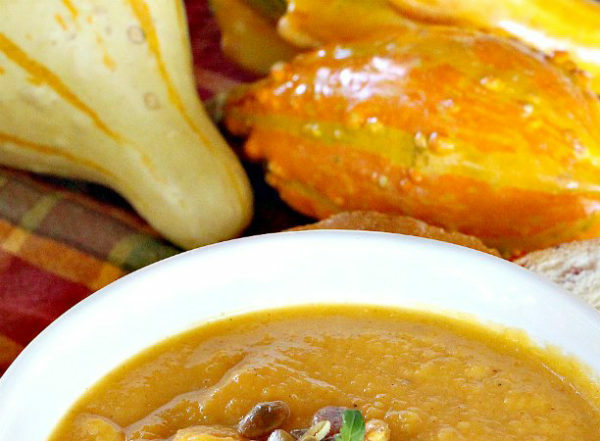 My favorite is probably the autumn squash soup they have at Panera Bread, so I have scoured the internet for recipes that are copycats for those delicious restaurant squash soups. There are a lot of them, but I found a few that seemed pretty close and this was my favorite, I made a few alterations to make the soup the way I like it but the original recipe came from www.fakeginger.com. She has a lot of great recipes and you definitely should go check out her site! It seems fairly easy to make. Now I admit, the original recipe on her site is a LOT closer to the Panera Bread soup. With my add-ins, it is a little sweeter, but I liked it and I think you will too. Maybe you’ll want to try them both! January is a cold month in a huge part of the United States, so it’s a great time to stay in and make a pot of tasty soup and play some games! I hope you make this soup and enjoy! 1. In a large soup pot, heat heat coconut oil over medium-high heat. Add onion and cook, stirring occasionally, until onion is soft and translucent. Add garlic and cook until fragrant, about 30 seconds. 2. Add butternut squash, carrot, pumpkin puree, vegetarian broth, apple juice, honey, curry powder, cinnamon, pumpkin pie spice and salt and pepper. Bring to a boil, cover and lower to a simmer. Cook about 15 minutes, until the butternut squash is fork tender. Use an immersion blender or a regular blender to blend in batches until smooth. Transfer back to the pot and stir in heavy cream. Heat through. 3. Garnish with pumpkin seeds before serving.